Wiley-Blackwell has published a new book on stakeholder management in the construction industry, edited by Ezekiel Chinyio from the University of Wolverhampton and Paul Olomolaiye from the University of the West of England. This book is designed to map the current state of stakeholder management in the construction industry with input from a range of well known academics and researchers. Our chapter on Mapping Stakeholders can be previewed on our Interesting Book’s page with links through to the publisher’s web site. The last of these facets tends to be over simplified in many texts. There is not just an east/west divide! Robert J House in Culture, Leadership and Organizations (2004 – Sage Publishing) reported on the Global Leadership and Organizational Behaviour Effectiveness (GLOBE) program that is undertaking a long term study of 62 societies. a. Anglo – North America, UK, Australia /NZ and ‘white’ South Africa. c. Latin – Portugal, Spain, France, Italy, Israel. d. Eastern – Poland and Greece to Russia. e. Nordic – Denmark to Finland, Iceland. Sub-Sahara Africa including ‘black’ South Africa. Latin America – Mexico to Argentina. The GLOBE study focused on the interrelationship between societal culture, organisational culture and organisational leadership. Attributes such as uncertainty avoidance, power distance and performance -v- human orientation were considered. High context societies place great importance on ambience, decorum, the relative status of the participants in a communication and the manner of the message’s delivery. Effective communication depend on developing a relationship first, because most of the information is either in the physical context or in the context of the relationship, therefore relatively little needs to be in the coded, explicit, transmitted part of the message. Communication in low context societies tends to have the majority of the information vested in the explicit code transferred by the message. People from high context societies (eg, France or China) may think people from a low context society (eg, Germany or USA) think they are stupid because the low context people include all of the information in a message. Similarly, people from high context societies are unlikely to express their disagreement or reservations in an open meeting, circumstances and relationships are as important as work so they would comment in a more private or appropriate occasion but only if the opportunity is provided. Shame or guilt considers whether a person has an outwards orientation based on the judgement of others or an inward orientation focused on their core ethical values to encourage high performance and moderate poor performance. O-Type organisations are where the employees see themselves as a permanent part of the group; they are part of a social collective. M-Type organisations are more focused on individual achievement. Field-dependent societies adhere to structures and perceive or experience communication in a global fashion. Field-independent societies and people are analytical; they can self-structure situations and have self-defined goals and reinforcements. These differences in approach were one of the reasons I posed the question ‘do we need cultural extensions to the PMBOK?’ (see: PMI’s Voices on Project Management). But while understanding cultural stereotypes may be a helpful starting point, no grouping or stereotyping will provide the necessary subtleties needed for important communication. Firstly, everyone’s experience is unique and the person you wish to communicate with will have been moulded by a range of influences including the corporate and professional cultures they have worked within. Second, no study I am aware of has focused on the effect of the global communication network on national cultural behaviours. The concept of baby boomers, X, Y and Z Gen, is very much a western phenomena, there are certainly likely to be age groupings in other cultures but where the divides lie and how technology interacts with the national characteristics is largely unknown (at least to me). Thirdly, people travel widely for both education and work, even after returning home they will have absorbed some of the influences of the other cultures they have lived in. So how should you approach the planning of an important communication? As a start, try to define the normal communication mode of the person you are seeking to influence or inform. Understanding national characteristics helps, but is not enough; you need to seek information from a wide range of sources. Err on the side of caution if there is any doubt about the optimum mode for communication. Then carefully observe the effect of your initial communication on the receiver and adjust the mode until you achieve a satisfactory result. My paper for the PMI Asia Pacific Congress, Beyond Reporting – The Communication Strategy, is also focused on the topic of effective communication, as is my next book, Advising upwards: A Framework for Understanding and Engaging Senior Management Stakeholders due for publication in 2011. So expect more on this subject in the New Year. Mosaic experienced a sudden surge in training enquiries during the last few weeks of 2009 (the end of the noughties). We assumed this was associated with the end of the GFC induced slow down in Australia but there would appear to be a deeper problem. The Australian Institute of Management (AIM) has just released a major survey that suggests that 40 per cent of Australian organisations are already seeing a negative impact on profits and performance goals caused by a skills shortage; 76% of more than 2,000 executives surveyed said their organisations have a workforce ‘skills gap’ where the term ‘skills gap’ was defined as the gap between an organisation’s skills needs and its current employee capabilities. Interestingly, 65% of the respondents who did not think there is a skills gap in their organisation, believe their organisations have avoided a skills gap by a strong commitment to training and development. Given our workshops and PMI Credential courses cover most of these shortages, it looks as tough we are in for a busy start to 2010; however, before then we are planning to slow down through the holiday period to recover and prepare for a busy 2010 starting with our first PMP and CAPM course on the 11th January. Wishing you all a happy, safe and peaceful Christmas and New Year. I was a passenger on Qantas flight QF10 Singapore – Melbourne on 17th Dec. that experienced an engine failure after take off and had to return to Singapore. From a risk and issues management perspective, overall the Qantas response was very good. In flight the information provided to passengers was timely, accurate and relevant. By the time the aircraft landed some 40 minutes after the incident, busses and hotel rooms were organised, the hotel had found additional staff so check-in was quick and an evening meal provided (not bad for a problem that occurred close to midnight Singapore time). The pre-organised emergency response plans even included bright orange stickers to ware so people directing us to the busses, etc could identify the 350 odd people from the flight. Overall, from the flight crews response to the initial problem through to the ground crews management of 350 disoriented passengers the initial response was great an clearly demonstrated a well thought out response plan. However, once the initial issues were managed, the following 12 to 18 hours were not so good – perhaps the accountants started to worry about costs?? There was no local contact point provided, no ability to deal with individual issues such as my need to access the Mosaic business systems (I had to pay for the connection) and only limited communication. The communications were OK as a basis but lacked individuality. What I find really strange is the time one would have expected problems immediately after the engine failure the Qantas service was exemplary, later when one would have expected the situation to be under control the Qantas service collapsed to a fairly low level of customer care. The lessons to be learned from this experience are twofold. Firstly, good response plans really do make a difference, and there may be a place for generic plans at the organisational/PMO level for issues likely to occur across a range of projects rather than each individual project inventing their own. These generic response plans could also identify corporate resources that can be called in to help resolve an issue. The second, more important lesson is the effectiveness of the initial response can be seriously damaged if the caring diminishes before the people inconvenienced by the issue are fully over the problem. The Qantas response was technically efficient, through to flying a replacement aircraft into Singapore for our journey to continue some 23 hours later; there are only a limited number of aircraft sitting around with nothing to do…..
Where Qantas failed was in personalising the follow through to help people such as myself who lost a days business minimise the inconvenience. Just a little extra care and I would have been praising Qantas 100%, as it is I feel rather disappointed in the final outcome: a C+ response rather than an A+ and all of the grades were lost at a time when the organisation had had time to think about its reaction, rather than when the problem first occurred. Risk response plans need to deal with more than just the technical issues. Managing people’s expectations and disappointments is at least as important if the overall damage caused by a risk event or issue is to be minimised. The Chartered Institute of Building (CIOB) has for many years seen its role as the leader in construction management. The current challenge is to define and differentiate construction management from project management and from the role of an on-site construction manager. I have been in the UK for the last couple of weeks and was at the CIOB Member’s Forum where this topic was discussed at length. My feeling is construction management has a very wide remit that underpins all phases of a built assets lifecycle from feasibility through to demolition and disposal. My starting point is the presumption that construction management involves the application of construction knowledge to achieve the efficient creation, maintenance or changing of a built asset. Where a built asset, or the built environment, is a very wide definition that covers all man made structures from canals, roads and railways to any structure or enclosure. As suggested by the diagram below, the application of construction knowledge through construction management has a very wide application. Whereas project management is focused on the efficient creation of a new product, service or result. Project management has a much wider remit than simply building. Any significant change can and should be managed as a project from the creation of a new software program to the reorganisation of a business’s processes. 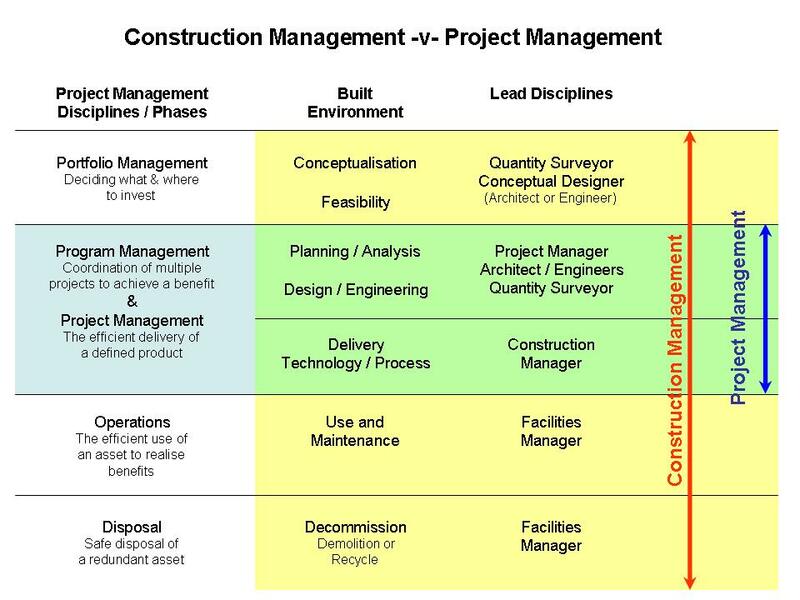 The primary role of traditional project management in the construction industry (as indicated in the diagram below) is managing the site based construction activities from initiation through to closure. However, it is quite feasible for projects to be initiated at any phase of the built assets lifecycle to initiate a ‘change’ (eg, a maintenance project to upgrade the facility). Also, if multiple projects are involved such as building the 2012 Olympics, program management can be used to advantage. If the ideas outlined above hold true, project management is the process of delivering a change, whereas construction management is the underpinning skill set used by a range of specific disciplines, including project management, as the built asset evolves from an idea to a design, to built structure, to a maintained facility through to its final demolition or recycling. It’s the knowledge of good construction practice that allows the surveyors and designers to create a cost effective design that is durable, buildable and maintainable; and similar knowledge is needed by facilities managers to look after the structure through its operational life. As suggested above, construction management is the effective application of construction knowledge to a proposed or actual built asset. Based on these thoughts, a working definition for construction management could be: The effective application of construction knowledge to all aspects of the creation and care of the built environment to the benefit of society. The lead discipline will change from Architects and cost engineers to construction companies and project managers to facilities managers depending on the phase in the built asset’s life, but each discipline also needs to understand and apply effective construction management to undertake their work practically and effectively. How to Suffer Successfully, is the title of chapter four in Alain de Botton’s first book of philosophy, How Proust Can Change Your Life. The same idea is the theme of The Adversity Paradox by J. Barry Griswell and Bob Jennings. The Adversity Paradox is full of inspiring examples of people who have suffered major adversity and have used the experience to improve their capabilities and gone on to outstanding success. The knowledge they gained from overcoming obstacles has played such a crucial role in their success trajectories that they now consider adversity to be an invaluable friend. De Botton takes a more philosophical view and recognises there are ‘bad sufferers’ and ‘good sufferers’. Bad sufferers learn nothing from their adversities and react to them by engaging defence mechanisms that compound the problem such as rage, delusion and arrogance. Successful sufferers, including those identified in The Adversity Paradox, use their adversity to gain a better understanding of reality and by rising to the challenge, create a better future for themselves and others. Whilst no sane project manager would chose to suffer sufficiently to produce their version of Proust’s In Search of Lost Time, only the most naive would expect their project to run without a problem. Projects and their attendant stakeholders are a potential source of much grief and suffering, all be it at a lower level of intensity; schedule slippage test failures, cost overruns and accidents to name a few. No one likes a project that fails! However, it is only when you are experiencing the pain of failure, the opportunity to learn from the failure opens up. By using the opportunity to maximise the lessons learned, you minimise the potential for similar problems in the future. The cost of the failure is the coin by which future gains are purchased. The difficulty is developing the level of understanding needed to really achieve valuable lessons learned; finding the ‘cause of the cause’. The second more complex challenge is ensuring the lessons learned are transferred to the organisations store of knowledge and available for others to use and thereby avoid unnecessary pain and suffering. De Botton suggests being a ‘good sufferer’ does not entail subscribing to the Romantic cult of suffering for its own sake, rather making practical use of the occasions when suffering is unavoidable to create new insights and grow in capability or knowledge. Our addition to this basic idea for the practicing project manager is to then make sure the lessons learned are effectively distilled, recorded and made available to others for the future benefit of the organisation and the profession. Oracle, the owners of Primavera have sponsored a survey by the Economist Intelligence Unit of The Economist, looking at the link between project management excellence and long-term success. The report was based on a survey of 213 senior executives and project managers worldwide and in-depth interviews with nine executives and project management experts. What do the other 10% do? How is it possible to undertake projects and not do project management. I would have thought is was impossible to do a project without doing project management and consequently project management was critical to doing projects. More than 50% of the people interviewed disagree. And interestingly more then 50% of project fail maybe there’s a correlation? Probably a more significant question is what do the respondents to the survey mean by project management? Despite the well established standards defining project management ranging from the PMBOK® Guide to PRINCE2, do over 50% of the people responsible for project still fail to grasp the essentials?? The same survey found nearly one-half (49%) of the respondents only follow formal project management practices on large or complex projects and few (20%) use a standardised set of project management tools including enterprise-level systems. Which is consistent with Gartner’s findings that smaller project fail more frequently then lager projects. It looks as though PMI, IPMA and academia have a lot of work to do to make project management effective in business. It would appear that whilst executives recognise the value of delivering projects on time, on budget and to the customer’s expectations very few are prepared to invest the resources needed to achieve effective project management. This reminds me of another quote by Lister DeMarco from a few years ago: “Quality is free, but only to those that are willing to pay heavily for it!” There should be a PM equivalent somewhere…..